The parking lot or private road in front of your commercial building is where your business makes its first impression. Within seconds of entering your company’s lot, your customers have already made some assumptions about the nature of your business and the quality of service they can expect when they get inside. That is why it is essential to your business to realize the importance of a finely manicured parking lot or private road. Dirt Connections offers a number of commercial asphalt paving services that can help your business put its best foot forward and make an immediate good impression with an impressive and pristine parking area. We are ready to be on site at your commercial facility today to inspect your parking area and diagnose any potential issues. Completing regular inspections of your parking area is essential to maintaining a structurally sounds and good looking lot. 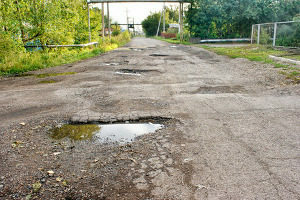 The quick and inexpensive fix for potholes in your parking area is patching with hot asphalt. This will provide a temporary solution to damaged spots in your asphalt paved area. Hot asphalt is poured over the damaged area, flattened, and the edges are sealed to prevent water damage. Resurfacing involves the pouring of a new layer of asphalt over an existing asphalt layer. This option is not effective in cases where the underlying base the asphalt rests on is significantly deteriorated. However, when it is possible to simply resurface an area rather than replace the entire section, your business stands to save money while simultaneously giving the parking area a like-new look. Resurfacing is not advised in sections where water flows have caused the existing asphalt to deteriorate significantly, or the existing asphalt has started to crumble. Over time your parking area will inevitably start to crack and wear down. As winter chills freeze water that has seeped into your paved area, cracks will start to become visible and grow. It is important to fill in cracks often before they become potholes or lead to the degradation of your parking lot’s soil base. Using commercial grade rubberized crack filler will help reduce the penetration of water and other materials that can degrade your parking area. A full depth repair is necessary when the underlying base of the parking area has been significantly compromised to the point where the parking area is now unsafe, unsturdy, or unuseable. During a full depth repair, the entire top layer of asphalt will be removed, down to the base layer. 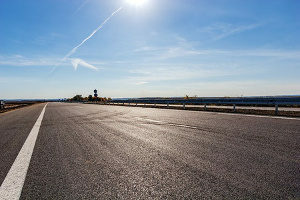 If this base layer is not stable, Dirt Connections will continue removing layers until a stable one is found upon which the new commercial asphalt paving can be placed. During a partial depth repair, the top 2 inches of the existing asphalt are removed and replaced. This method of repair is not useful is the sub-base of the parking area has significantly deteriorated. Once the new compacted asphalt is in place, the edges are sealed to prevent water from permeating to the parking area’s underlying soil. Sealcoating is vital to maintaining an attractive and functional parking area. It involves a protective coating being sprayed or squeegeed onto the existing asphalt surface. Every 2-3 years your entire parking area needs to be sealcoated to prevent corrosion from car fluids, degradation from rainwater, and to keep your lot attractive to customers and looking brand new. Bright, visible lines in your parking area will help keep your lot safe for customers driving through, and aesthetically appealing. 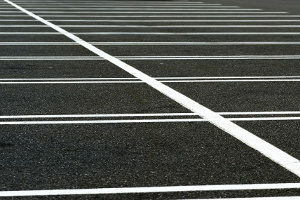 Dirt Connections has the tools to provide your parking lot with the appropriate markings and signage. When taking the time to restore, maintain, or replace your parking area or business’ private road, you want a business partner who will work tirelessly to provide you with the right solution to fit your needs. Dirt Connections has the experience and record of customer service commercial property owners and facility managers look for when considering a trusted construction project partner. Contact us today for your free commercial lot assessment and estimate!